Anticipation is building for the 2014 REDY…Set…Let’s Go! Youth Triathlon as the on-line registration site is live for the third annual event aimed at getting kids to be more active. 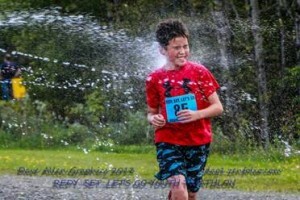 The youth triathlon, a collaboration of TAMC, Aroostook County Action Program’s (ACAP) Healthy Aroostook, and the University of Maine at Presque Isle, can accommodate over 100 children. Like the adult version of the sport, “REDY” will consist of swimming, biking, and running. Participants between the ages of 7 and 10 will swim 50 yards, bike 2 miles, and run one-half mile. Participants between the ages of 11 and 14 will swim 100 yards, bike 2.5 miles, and run 1 mile. “REDY” is not, in fact, a misspelling but the name of the well-known mascot of Let’s Go 5-2-1-0, a nationally recognized youth obesity prevention program that has partners throughout Maine. The popular figure will be present at the event to encourage the participating youth to stay active, eat a healthy diet, and avoid spending too much time in front of the television. Event organizers named the triathlon after the well-known mascot because he embodies what the triathlon is all about, which is providing kids with an opportunity to get active in a fun, safe, and supportive environment. The University of Maine at Presque Isle will host the event, providing participants with an opportunity to swim in the Gentile Hall pool, as well as run and bike through much of the scenic campus. University officials are looking forward to welcoming triathletes, their families, and volunteers to campus. Triathlon organizers have been helping participants reduce their risk of injury by emphasizing preparation. Many triathletes have been preparing at free monthly swimming, running, and yoga training sessions that have been held at UMPI throughout the summer. The sessions are intended to help participants increase endurance in the pool, become familiar with the course, and build physical skills that will help them for not only the coming event, but for their overall wellbeing. “We are very excited to be partnering with TAMC and Healthy Aroostook for a day focused on kids, physical activity and healthy lifestyles. We can’t wait to see local youth swimming in the pool and biking and running throughout campus on September 7 and we invite everyone in the community to join us and the youth triathletes for their big day,” said UMPI President Linda Schott. The event supports the principles of obesity prevention developed by Let’s Go! 5-2-1-0. A 2010 study commissioned by EMHS, MaineGeneral Health, and MaineHealth found that Aroostook County has the highest percentage of overweight high school students in the state. The goal of Let’s Go! is to reduce the rate of childhood obesity by encouraging children to eat more fruits and vegetables, limit time spent in front of a television or computer, increase physical activity, and eliminate sugary drinks. The local effort is headed up by Healthy Aroostook and EMHS in collaboration with other community partners including TAMC, schools, workplaces, and others. For more information or to register a child for the 2014 REDY…Set…Let’s Go! Youth Triathlon, go to www.redyyouthtriathlon.org. Volunteer assistance is also needed at all stages of the course. Those interested in getting involved should visit the same website for more information.